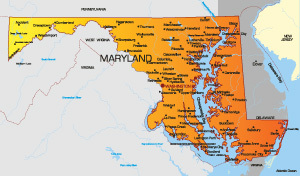 Maryland may be one of the smallest states when talking about area, but it is one of the most populous states with a population of nearly 6 million people. Maryland was also one of the original 13 colonies and the seventh state to ratify the United States Constitution. The capital city is Annapolis but the largest city is Baltimore, which has a population of 600,000 residents. The bordering states are New Jersey, Pennsylvania, West Virginia, and Virginia. The major highways are I-95, I-68, I-70 and I-83. Other modes of transportation, including air travel, can be used in airports like the Baltimore-Washington International Airport. Notable universities in Maryland are Johns Hopkins University and the University of Maryland.